The new library is great and will be a great asset to our community. 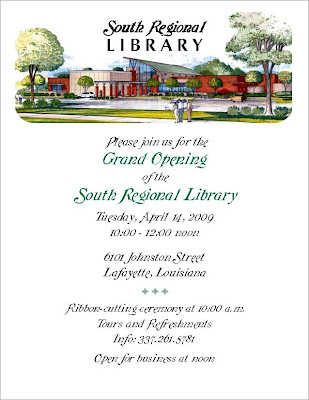 It would have been nice for more of the "community" to be able to attend the grand opening. Having it on a Tuesday at 10:00 am doesn't leave much room for us of the community who have to work for a living. Thanks for your comment. We realize that not everyone can attend at 10 on a weekday. For North Regional, we selected a Saturday morning, which prevented some from attending due to sports, family, and other weekend activities. For South, we selected the day and time since it is during National Library Week and the children are out of school for Spring Break. What a beautiful library! I absolutely fell in love with the cute children's section! What a long way the Southside/regional has come; it was totally worth the wait. I have always loved the library and now I love it even more. I hope that this library is a place that can be a part of my life for a long time. My dream is to be a school librarian, but that may change after seeing this spectacular public library. Also, I can't wait untill the renovation of the main library is finished. The presentation was spectacular! Great job to everyone who was involved!